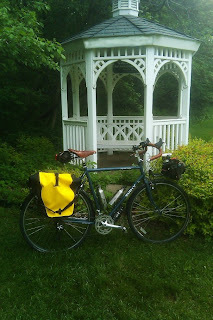 The subject of this personal blog is the discussion of items that relate to bicycle touring. The posts describe projects, trips and equipment involved with bicycle touring. All information and reviews are personal opinions of items that have been purchased and used. No Vendors provide items to be reviewed. All links are for convenience (navigation tools primarily for the author) and the author is not affiliated to any businesses that are linked to. The blog is just for fun... and to share the Bicycle experience with anyone with similar interests. It is also a handy tool for keeping a record of riding and equipment.